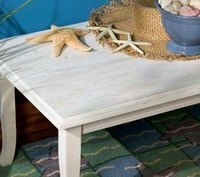 Whitewashing furniture creates a gentle distressed or antiqued look by simply applying whitewash or watered down white paint to your furniture. Whitewashed furniture is popular in country or cottage-style homes and decor. It is possible to whitewash painted furniture, but it takes time and the steps vary depending on the look you want to achieve. Protect nearby items from sand and paint dust by covering them up with a cloth or tarp. Wear goggles and protective clothing as well. Sand down the furniture. Remove some or all of the paint to allow the whitewash to stick. If you want the paint to show through the whitewash, sand it lightly with a fine-grain sandpaper. If you want the furniture to be completely white, you will have to remove all of the paint with a sander. For small areas such as corners, you will probably have to sand by hand. Wipe down the furniture with a damp cloth to remove any last traces of sand or paint. Alternately, you can rinse it off with a hose. Let it dry completely. Apply the whitewash with a paintbrush. Start by applying it to the small areas with a dabbing motion, then use broad, sweeping strokes to apply it to the large areas. Let the whitewash dry completely, then apply a second coat if the look is not dark enough for you. You could also apply a coat of varnish (use a new paintbrush) if you want to protect the whitewash, but realize that it will leave a shiny finish, which might not be the look you are going for. Start with a smaller piece of furniture until you are confident in your technique.